The Winnipeg Hearings for the National Inquiry into Missing and Murdered Indigenous Women and Girls is scheduled for this October. At the political level the need for this inquiry has been greatly debated, while among Indigenous Communities there is recognition that something must be done to insure the safety of Aboriginal Women and Girls, who are 3.5 times more likely then their non-native peers to experience domestic abuse or assault. The MMIWG Inquiry is having difficulty getting organized, communicating and meeting the needs of the families involved. Critiques like Mi’kmaq lawyer, professor, activist and politician Pam Palmater are speaking out how the MMIWG is not doing justice to the inquiry process. “A look at what needs to change: The National Inquiry into MMIWG and Thunder Bay | APTN InFocus.” YouTube, YouTube, 4 Oct. 2017, www.youtube.com/watch?v=Vn1st84_ZeY. “National Inquiry into Missing and Murdered Indigenous Women and Girls .” National Inquiry into Missing and Murdered Indigenous Women and Girls, www.mmiwg-ffada.ca/en/. Music shared through technology is aiding in the resurgence of Indigenous Cultural Awareness. Indigenous Culture is being celebrated and shared through music. In the past First Nation artisits like Buffy Sainte Marie and Susan Aglukark were considered an exception. Presently we are seeing more Indigenous artists being celebrated in mainstream entertainment not just for their musical talent, but also for their contribution to Aboriginal Culture. Many of the songs written and performed by these artists share language, traditional song, drumming and dance as well as messages about traditions, the impact of colonization and histories of Indigenous Peoples. In a CBC interview singer and songwriter Art Napoleon said he choose to produce his album “Creeland Covers” entirely in Cree in order to share a little of the language with others. While groups like A Tribe Called Red are using their popularity to increase awareness about the hardships Indigenous Peoples face worldwide. Johnson, Catalina Maria . “The Anti-Colonial Beats of Indigenous Hip-Hop.” Bandcamp Daily, 18 July 2016, bandcamp.com/2016/07/18/indigenous-hiphop-feature/. Monkman, Lenard. “Tom Petty song Wildflowers lives on in Cree language.” CBCnews, CBC/Radio Canada, 4 Oct. 2017, http://www.cbc.ca/news/indigenous/tom-petty-cree-cover-1.4327630. While not discussing digital storytelling, this article does articulate many of the themes I’m interested in exploring in my final project: raising political consciousness of Indigenous rights, drawing attention to how mainstream media works to “naturalize” imperialism, and the digital realm as a dynamic communication network that bolsters tribal political, cultural, and spiritual sovereignty. This article discusses how Indigenous digital storytelling in video tells the story of what has happened and is happening in the lives and work of Indigenous peoples. Alma Desjarlais is an Indigenous Elder who shares her stories to help people understand the histories and strength of Indigenous peoples. The above link shows the trailer for the film, Grandmothers of the Metis Nation. The film shares stories of Metis grandmothers to demonstrate the roles and responsibilities of Metis women in the past and today. One of the grandmothers is Alma Desjarlais (from the article above), who explains the roles of grandmothers as educators and healers in their communities. Healing the wounds of “colonial contagion” is a process that’s articulated through the spoken and written words of Aboriginal writers. Indigenous digital stories present counter-narratives to the Canadian settler state to give voices to otherwise silences experiences of the effects of colonization.It focuses on therapeutic possibilities of digital storytelling and warns of limiting the healing potential to simply matters of cultural assertion. It also discusses the limits of digital storytelling and how some individuals and communities may not have the resources to participate in digital storytelling. This article summarizes the differences in Canadian local press coverage of missing or murdered Aboriginal women and white women. It discusses stereotypes that make Aboriginal victims less likely to be covered in news stories and the idea that victims are divided into stereotypes of “pure” women who are newsworthy victims and fallen women who are not (aka “missing White woman syndrome”). 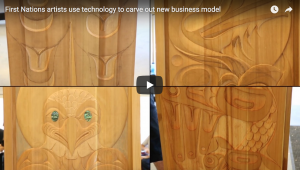 Under the mentorship of Ken McNeil and utilizing the latest design and fabrication technology, UBC is working with local First Nations to carve out wood/cedar ‘story panels’. Using modern scanning and CNC router technology, unique limited edition prints and panels are produced to promote the cultural connection between the artist and the cedar. For many of these artists, the panel design and the technology used allows for a greater means of expression producing a ‘self-portrait’ of the designer. Aboriginal art is an estimated $2-billion market worldwide, but only for a few select, high-end artists, with galleries making the majority of the money through the hops is the training and application of computer-assisted machining technologies will lead to added wealth for the artists and First Nations communities. The panels, which are functional works of art, take hours to complete and are one-of-a-kind. For many of these artists, the panel design and the technology used allows for a greater means of expression producing a ‘self-portrait’ of the designer. Aboriginal art is an estimated $2-billion market worldwide, but only for a few select, high-end artists, with galleries making the majority of the money, though the hope is the training and application of computer-assisted machining technologies will lead to added wealth for the artists and First Nations communities. The panels, which are functional works of art, take hours to complete and are one-of-a-kind. For my second post in Module 2, I wanted to share some of the websites I did not list in the discussion board that I have found for my project on extra-curricular activities and school based programs designed for Indigenous Youth in Canada. 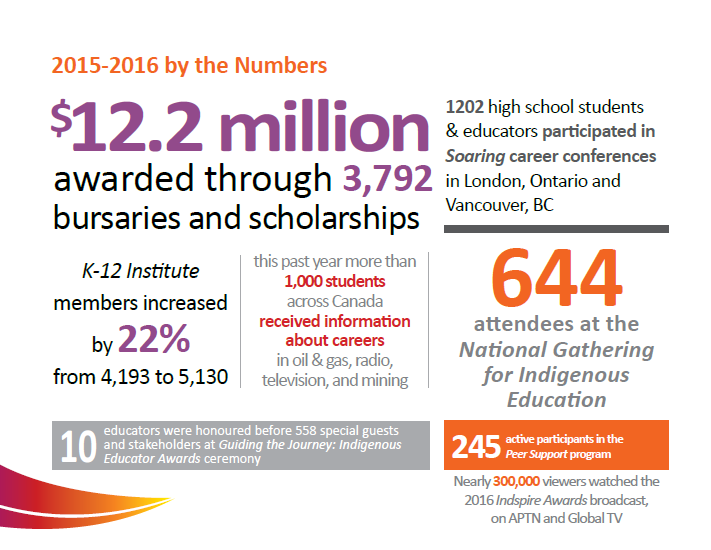 Using information from the Aboriginal Peoples Survey (APS) of children and youth, StatCan compiled information about Aboriginal youth participation in sports and cultural activities. The survey includes important data that made a connection between youth that participated in sports and those that also participated in extra-curricular activities. The survey also explains that the use of an Aboriginal language and spending time with Elders are connected to participation in cultural activities. The Indigenous Youth Futures Partnership is based out of Carleton University and is a seven-year SSHRC-funded partnership grant. They work with First Nations communities in Northwestern Ontario. The objective of the program is to encourage young community leaders by enhancing cross-generational relationships, empowering youth voices, strengthening cultural identity and helping sustain communities. IndigenEYEZ hosts youth camps for Indigenous youth and adults in BC. The program uses the Creative Community Model to empower and inspire future community leaders. They integrate a holistic approach, by integrating four essential relationships: with self, with others, with nature, and with culture. They host annual summer camps and offer customized community workshops. The contribution of the Indigenous Peoples to the survival of the early European Settlers is often glanced over, or not touched upon at all in our classrooms. It is important to remember that without the help of Indigenous Peoples settlers would not have survived, contents would not have been so easily explored, skills would not have been learned. Unfortunately these early teachings were lost in the idea that one culture was better then another, and that there was no “science” behind Indigenous Medicines. The website RealFramacy.com lists 31 of the well Native American medicines. Unfortunately there are many more that have been lost because of the refusal of the dominant culture to understand, and learn from other cultures. The 1992 Drama “Medicine Man” touches on the idea that many traditional medicines have been lost to the world because of colonization and in turn – industrialization, and globalization. Perhaps technology can document traditional medicinal knowledge before, like many languages, it is lost to the world. Perhaps the sharing of traditional medicinal knowledge online will allow the sharing of history and create a culture of respect for Indigenous cultures. McTiernan, John, director. Medicine Man. Medicine Man, Hollywood Pictures Cinergi Pictures, 7 Feb. 1992. 31 Powerful Native American Medicinal Cures.” com, 17 Jan. 2017, realfarmacy.com/forgotten-native-cures/. University of Alaska Fairbanks graduate student Qaġġun Zibell (Chelsey), developed a website that will help introduce the Inupiaq language. In an interview Zibell recognizes that the website cannot fully teach the language, but can be uses as a more modern resource for connected learners. The site features games, videos and interactive activities. The University of Alaska Fairbanks Information and News Bulletin also notes that Inupiaq is designated as a “severely endangered” by The Endangered Languages Project. Carl-Acosta, Marissa . “New Website Helps Teach Inupiaq.” UAF news and information, University of Alaska Fairbanks, 11 Oct. 2017, news.uaf.edu/new-website-helps-teach-inupiaq/. “The Endangered Languages Project.” Endangered Languages Project, www.endangeredlanguages.com/. Zibell , Qaġġun . “Inupiat Langauge.” Inupiat Language, University of Alaska Fairbanks, July 2017, inupiatlanguage.community.uaf.edu/.